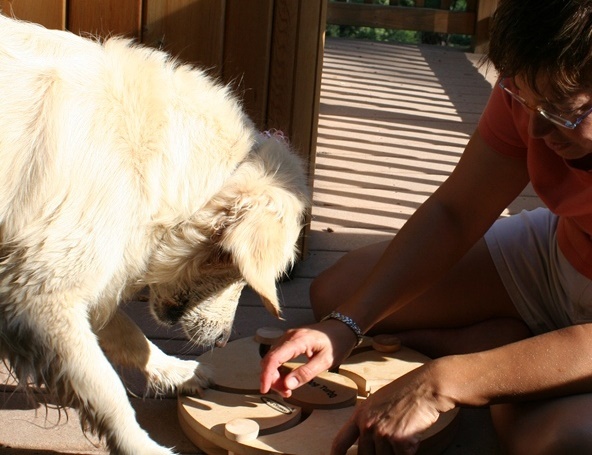 HomeWhat Is Cognitive Education for Dogs? What Is Cognitive Education for Dogs? Welcome to an all-new, improved Thinking Dog blog! It is re-launching with a new focus — cognitive approaches to educating dogs. What does that mean? Think of it as a contrast to the more traditional approaches, many of which use force, to train dogs. Cognitive-based dog education means teaching dogs to think their way to becoming their best selves. Their best what, you ask? Well, that answer is different for every dog — just as it is for every person. It’s not a new idea: In 1963, Clarence Pfaffenberger wrote a book called The New Knowledge of Dog Behavior. A line in that book beautifully captures the essence of cognitive education. Pfaffenberger writes that the first time a puppy to removed from his or her littermates for training, the puppy is given “the dignity of being an individual.” All dogs deserve this. It is this understanding that forms the basis of cognitive education for dogs. In 1995, Vicki Hearne published a classic piece, “A Taxonomy of Knowing: Animals Captive, Free-Ranging, and at Liberty.” In it, she describes the ideal relationship between a human and a non-human partner (most of her examples are dogs): the team shares a goal, recognizing and respecting the unique abilities that each member of the team brings to the joint pursuit of that goal. An animal working at liberty, Hearne writes, is one “whose condition frees her to make the fullest use of some or all of her powers.” A great example is a search-and-rescue team. The dog brings amazing powers of scent detection and tracking to the partnership; the human brings logistical planning abilities and much more. The point is, neither partner, alone, could be as successful in the goal of finding a lost child as they are as a team. Dogs in at-liberty partnerships are being the best that they can be. Cognitive education can get you and your dog there. Remember Maslow’s hierarchy of needs (Psych 101)? Basic stuff like food and shelter are at the bottom. More esoteric needs, like social acceptance and aesthetic enjoyment, are higher up. The highest level is self-actualization — being the best you that you can be. That is what cognitive educators want for each and every dog. As Pfaffenberger acknowledged, each dog is a unique individual with likes, dislikes, strengths, weaknesses — and an idea of what he or she wants (and does not want) to do. Cognitive educators understand this and teach each dog as an individual. There is no one-size-fits-all approach to training. This approach enables each dog to be the best (fill in the blank) that he or she can. Some dogs can become fantastic service dogs; others are destined to work as scent detection or search and rescue dogs, serve in the military, or provide loving companionship to their humans. Some pets are great athletes who enjoy dock diving; others prefer Rally, flyball, agility, or freestyle dancing. Whatever your pet’s skills and preferences, you, as a cognitive educator, friend, and companion to that dog, can help your dog explore and develop and grow. If this sounds like something you believe in or want to learn more about, stick with The Thinking Dog blog. We’ll be exploring cognitive education from every angle — who does it and how; what it looks like in daily life; how to think like a cognitive educator; what dogs are telling you about their likes and dislikes and how to better understand them … and so much more. Check back often, subscribe to the blog, and be sure to share it with all of your dog-loving friends.